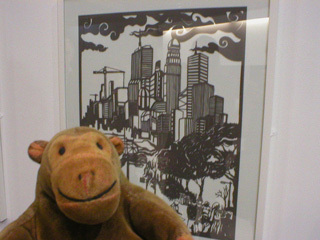 "That must have needed an awful lot of hand cutting"
On the wall, Mr Monkey examined Nature, Man, Machine by Andrew Singleton very closely. The design is a single sheet of black card with all the unwanted bits cut out by hand. 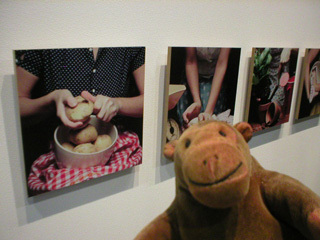 Mr Monkey also looked at the photos in Dawn Nicholls' A Woman's Journal, which were inspired by women's magazines from the 1920s.